I popped down to feed Maurice. Cheeky blighter had opened the First Aid kit and taken out a triangular bandage. No idea why - maybe he'd hurt his foot, or something? Or would it have made a nice duvet for him? Who knows! The day started cold with a light sprinkling of snow. David removed the rod which links the two rear sand boxes. The rod runs right across the loco under the cab floor and David had modified the shape to give clearance for the pipe from the new blowdown valve, as reported in Roger's report last week. Unfortunately when the sand lever was moved to start sanding, the rod jammed against the end of the slot in the frames so it needed yet another joggle put into it to give clearance. Meanwhile Alistair was cutting a piece of reinforcing metal for David to weld along one edge to allow the other edge to be cut away. Gilbert and Brian finished fitting the right leading spring, they then moved to the other side to determine whether the spring compensator between the leading and intermediate springs was seized. We were concerned that the springs on the front end of the loco seem to be out of balance and it was felt that the above mentioned compensator could be the cause. A jack was inserted under the compensator and to our amazement it moved quite easily, so back to the drawing board. Gilbert, Brian and Bruce then consulted Carpo, who suggested that we measured the length and depth of each spring and compare them to see if we had a weak spring, they all seemed OK.
After more head scratching we started to adjust springs to observe what effect this would have and slowly we managed to get the balance much better and good enough to run. Mark then towed the loco down to the headshunt and back to settle the springs down, after inspection they were deemed to be acceptable, phew! To finish the job we need to check all the axle weights again, but not until the boiler is full. By this time David had finished the sand box rod and Alistair fitted it, we thought it would be a good idea to test it. When the engine returned from the North York's Moors Railway the left sandbox was full and the right one almost empty, so some sand was transferred across and lever pulled. Success, the sand ran out of both pipes, 'OK turn it off', the sand stopped on the left side, but !!!!!!! it carried on trickling from the right side, no wonder it was empty. So there is yet another job to put on the list. 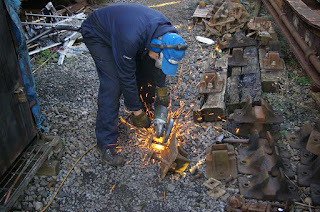 David also cut the drooping tender lamp bracket and re-welded it straight. It is painted ready for fitting. Bruce started the day in his usual lofty position - atop the boiler. He lapped and fitted the top clacks. John fitted the lamp bracket to the back of the tender. He was later told by Clive that the vacuum 'bag' was difficult to release, and could we adjust the angle of the dummy (onto which it clamps when not in use)? I suggested to John that simply moving the dummy down would relieve the force needed to persuade the vacuum pipe to clamp onto its dummy [an image of my grandson flew into my mind then … sorry!]. So, John removed the bracket that retains the vertical pipe; slid the dummy bracket down, and tightened it all up again. Success! Clive, by the way, was on the top of the tender applying a coat of bitumen to the back section at the time. Gilbert had decided that, as progress had been good, we could afford to spend time replacing the regulator valve. We have a minor design deficiency in the one we initially made, such that the small valve that should open first before the main valve … doesn't. We've had a new valve made. 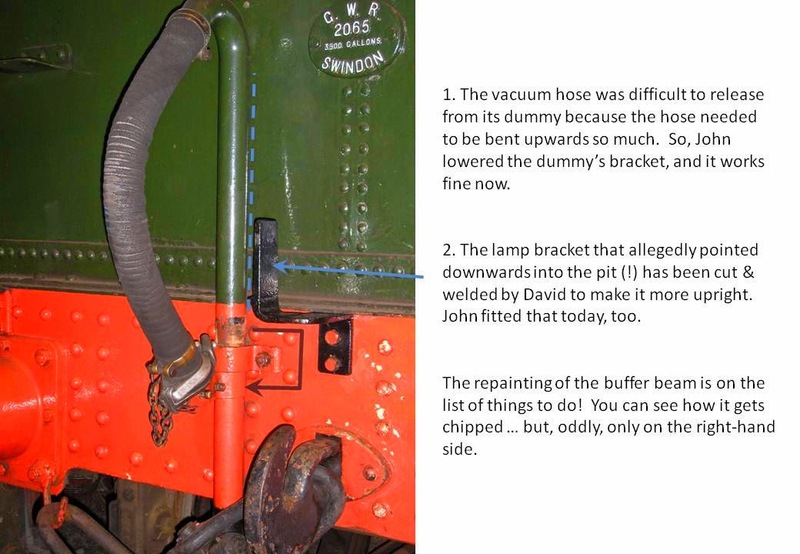 The only way to get at the regulator valve (which is inside the smokebox) is to remove the 'petticoat' that is attached to the bottom of the blower ring, which is attached to the bottom of the chimney [see diagram]. They would not undo. They refused to budge. Plan B was to cut their nuts off and bash the bolts through. 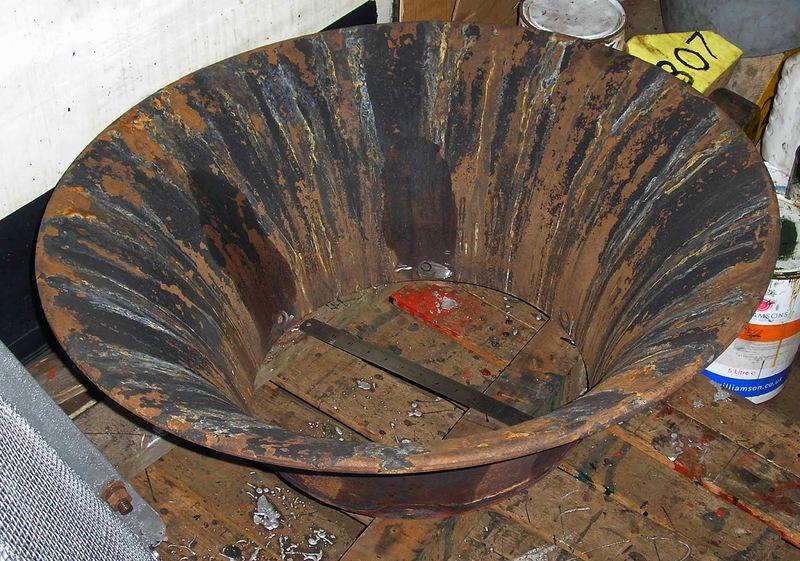 In the confined space of the smokebox, with various pipes in the way, this proved to be a struggle. Nevertheless, we managed to cut off the nuts … and bash out four of the six bolts! The two towards the rear were difficult to apply force to. Plan C was to cut off their heads, on the principle that there is more space inside the petticoat than behind it, and hence bash them out 'backwards'. OK, so their heads rolled. But would they bash out? Oh, Maurice: the game of hide & seek with his food bowl is getting a bit ridiculous! We all had a search, but to no avail. He's won today's game!